The Vivo NEX 2 features a 6.59-inch full borderless display with no gaps. It features an AMOLED screen with a resolution of 1,080 x 2,316 pixels and a density of 388 PPI. Under the hood, it consists of two quad-core Kryo 385 processors with clock speeds of 2.8 GHz and 1.8 GHz, based on the Qualcomm Snapdragon 845 chipset. It can provide outstanding performance together and is powered by the Adreno 630 GPU that handles graphics. There is an 8GB of RAM to ensure no delays in game or multitasking. 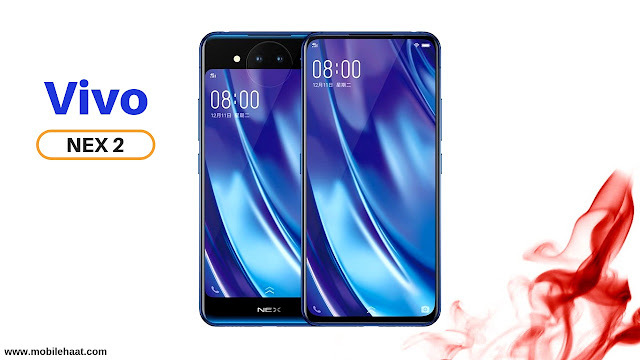 The device is equipped with a triple rear camera with a 12MP + 12MP + 5MP lens that captures stunning images with clear and natural color reproduction. There are no lenses on the front so the selfie and video calls will be carried by the main sensor. In order to keep the equipment running, the lithium-ion battery has a capacity of 4,100 mAh, which can provide a huge power backup. It also has fast charging support and can be recharged in a short time. The Vivo NEX 2 has a storage capacity of 128GB, which is huge for saving users' files and data. It ensures that there is almost no space left. There is no external memory slot. In terms of connectivity, this device supports 4G VoLTE. Other options include Wi-Fi 802.11, b / g / n, mobile hotspot, Bluetooth v5.0, GPS with A-GPS and Glonass, USB Type-C and more.